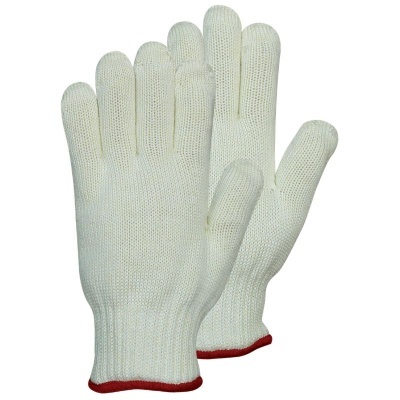 Made using a duplex knitted structure to create a glove within a glove effect that is both comfortable and highly protective, the Coolskin 375 Heat Resistant Oven Gloves are perfect for use in both home and professional environments, including bakeries and kitchens. The inner glove controls the fit and comfort, while the outer layer absorbs the heat, delivering the perfect heat-resistant glove. The 375 Heat Resistant Oven Gloves are designated Category III gloves, which makes them suitable for high risk environments. The Coolskin 375 Heat Resistant Oven Gloves are available in three sizes to suit you best. To find out which size you require, please measure the circumference of your hand around the knuckles (excluding the thumb) with your hand open and your fingers together. Then, measure the length of your hand from the tip of your middle finger to your wrist and consult the table below.